Hamburg, winter, freezing cold, snow everywhere. Time to book a short-term world trip in the world’s largest model railway in Hamburg: Miniatur Wunderland. I started in Switzerland with amazing, six meters high Matterhorn and the world’s highest ski lift, a railway station in the middle of the mountain and cute little villages. Then attended a medieval show with fire-breather in “Castello di Montebello”, collected some chocolate at a Lindt manufactory and watched DJ Bobo during a life concert in front of an audience of more than 20.000 mini people. In some parts of Austria, there was even more snow than in Hamburg at the time, in another part, I activated an alarm because a prisoner tried to escape from jail. In Knuffingen, an Austrian fantasy village, not only trains are driving all over the country, but a world-wide-unique car system allows true road traffic. The fair with its huge Ferris wheel and around 30.000 lights in the Harz is especially charming during night – a day in Miniatur Wunderland lasts 15 minutes. After a sightseeing tour around Hamburg including historic main station, Michel, Köhlbrandbrücke, Landungsbrücken and Hagenbecks Tierpark, I jumped over to the US. I discovered the Half Dome in Yosemite National Park, Redwood Mammoth Trees, Mount Rushmore to drive by genuine American truck on another huge car system highway or train to dusty red Grand Canyon with Bryce Canyon and have lunch with the cowboys. As this is pure nature and pitch-dark in the night, I preferred to stay in Las Vegas or the art deco district of Miami (beach) for some nights, or even underground in Area 51, coming back to Grand Canyon or the peaceful diver’s paradise Key West during next day a couple of minutes later. I beamed myself from America back to Hamburg via the Wunderländer Eurotunnel heading further North to Scandinavia through peaceful Norwegian landscapes, along scenic dune-rich beaches (including beach love) on the North Sea coast with high tide and low tide, huge container ships, the Flying Dutchman and an Atlantis-like underwater town. Travelled through ever-snowy Sweden, visited Kiruna, a finish ore mine featuring explosions and excavations, and even personally met some pixies. My world-trip lasted 3 hours, but I’m sure I haven’t seen all the little details that surprised me and made me laugh ever and ever again. 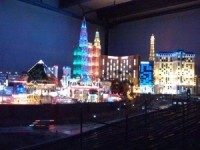 You can easily spend a whole day in Miniatur Wunderland, the creative ideas and technique are stunning. I will surely come back because an airport, Africa, Italy and France are in process. This entry was posted in Sightseeing and tagged Hamburg, Miniatur Wunderland, Sightseeing, Speicherstadt, Travel, World on February 16, 2009 by Silke Noll.